Mindclones are self-aware digital beings, able to think, reason, remember, and feel. A mindclone would be functionally identical to the living biological original mind simply existing now in two different substrates, one digital and one flesh. Your mindclone and you will cast the same vote, love the same children, and receive the same jury duty summons, and when your physical body dies you will live on, forever, as your mindclone. 2. Undeniable: Thousands of smart people are developing mindware (eg neuromorphic engineers, US BRAIN & EU HBP projects, Silicon Valley startups, hackers) to make the creation and use of mindfiles easier, with the ultimate goal, generally unintended, of giving them so many trappings of consciousness that some will seem to be (eg Siri), & some will claim to be (eg Bina48), humanly conscious. 3. Extrapolation: Humanly cyberconscious mindclones of us will arise from mindware operating on our mindfiles, and new cyberconscious beings who value human rights, which I call bemans, will arise from de novo or blended mindfiles and generalized human mindware. The extrapolation is warranted even if the brain cannot be replicated in software because brain is to mind as birds are to flight. 4. Implications: (i) Ethics will dictate that cyberconsciousness with human values and morality be accorded human rights and obligations – lack of a body is differently abled, not sub-human, (ii) Techno-immortality will result from the human rights of our mindclones – concepts of identity will change, (iii) the next demographic transition is toward majority cyberconscious societies – 10 billion is not the ultimate human cyberconscious population, and (iv) two of the most popular professions in the near future will be cyber-psychology and cyberconsciousness law as they will be on the frontlines of society’s effort to separate cyberconscious beings into human and non-human categories, with differential privileges to each. Transhumanist pioneer Martine Rothblatt covers this in her book, Virtually Human: The Promise—and the Peril—of Digital Immortality, suggesting that mindclones might use some sort of advanced digital personality profile to classify and emulate different people’s personalities. 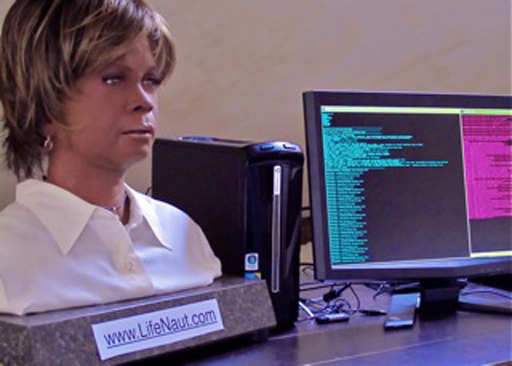 Rothblatt’s research has famously led to the creaton of Bina 48, a robotic head that houses a mindclone of Rothblatt’s real and still living wife Bina.Screen Shot 2015-01-15 at 1.54.52 PMBut Rothblatt’s book doesn’t suggest a way to build this personality model and some have been skeptical about how it would be done.